New Arrivals from Authorized Resellers. Type of Bass Guitar ELECTRIC. Number of Strings 5 STRING. GOOD SOLID PHYSICAL CONDITION. TWO KNOBS DO NOT FUNCTION. NOT SURE WHICH KNOBS THEY ARE. INCLUDES CASE. STRINGS ARE GOOD. NECK STRAIGHT. Left handed Hofner Standard Bass 500/1. This bass is very rare. They were made in Japan. A very important part of history of the 500/1 bass All parts are original. For sale is a recently built (late 2018) Chris Stambaugh custom 5 string bass. String width @ bridge- 18mm. Master Series Body. Scale length 34". Neck woods- 5 piece maple and purpleheart. Finish- hand rubbed oil/varnish. For sale is a 1983 Pre Ernie Ball Music Man Sabre Bass with a non-original Ernie Ball case. This bass is in very good condition and in perfect working order. It's on the very end past the highest fret so it never gets played. Body Material: Swamp Ash. Swamp Ash tone wood is known to produce a well-balanced tone. Premium Swamp Ash Wood. It’s not just about videos and know how; it’s about the person on the other end of the line. Fender Aerodyne Jazz Electric Bass Guitar. Condition is Used. The item is well maintained. Has a minor ding above the pickups the size of a pin head. Shipped with USPS Priority Mail or UPS . Ships only to lower 48 states only. This Hagstrom HB8 8 string electric bass in fantastic condition and excellent working order. The bass shows very little signs of ware. 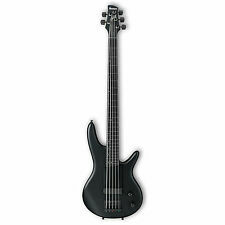 This is an amazing 8 string bass for the beginner in the bedroom or the professional gigging. New ListingAria Diamond Model 788 Bass Guitar...ARIA! DIAMOND!! Here's an Aria Diamond model 788 Bass Guitar, serial # 4475048, made in Japan. Guitar is solid clean & straight but the electronics don't work. 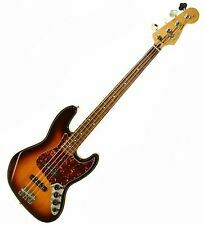 This is the Fender Squier Classic Vibe Bass VI Sunburst Electric Bass Guitar. Now is your chance to get a Fender Classic Vibe VI- in a great Squier 'reissue'. Over 30 years ago, Fender's unique Bass VI Jaguar baritone guitar was released to the world. I have played bass guitar over 50 years and have had short fingers my whole life! The best bass I could find for the money was a Warmoth bass so I bought all the parts for a bass and assembled it myself. Its extra-deep jumbo body, solid Western red cedar top, and Breedlove Atlas bracing system generates warm, deep bass tone. Condition is Used but MINT! OVERVIEW (From Breedlove Website). They feature scalloped bracing, a pinless bridge, a dual-action truss rod, and the JLD Bridge Truss System. New Listing2017 Guild Starfire Bass II Natural 100% Mint ! This neck profile is super comfortable and is perfect for all styles of playing from Jazz, to Blues, to Rock. This guitar is 100% MINT! with no signs of use at all. Body Color: Transparent Blue (TBL). Marcus Miller and SIRE wish to see everyone enjoying and playing music. To make this happen, Marcus Miller and SIRE have been on a mission for several years to build the best quality bass at an unbelievable price, making it available to everyone. DR Custom Bass Boutique 5 String Single cut thru body neck made by David Remy. Condition is Used. Shipped with UPS Ground. Condition is Used. This Charvel/Jackson bass has active electronics, 2 band eq and a blend knob. Slim body, slim neck. Monochromatic paint job with black hardware. Number of Frets : Fretless. Body Shape: Jazz Bass®. Bridge Pickup: Fender-Designed Single-Coil Jazz Bass®. Middle Pickup: Fender-Designed Single-Coil Jazz Bass®. (Bridge Pickup), Master Tone. Bridge: 4-Saddle Standard. Ernie Ball Music Man StingRay 5 Special 5-String HH Electric Bass, Roasted Maple Fingerboard - Burnt Apple. The first bass designed by Ernie Ball Music Man, the Stingray 5 was unveiled in 1987 and has been an industry standard for extended range basses ever since. Maple fretboard with pearl inlays and white binding. Pre-drilled for 3 hole body. Graphite nut. Excellent Greco Japan Electric Bass. Manufacturer: GRECO. Model: Electric Bass. This item is sold out everywhere in Japan and very hard to get it! Made in Japan. Normal, no problem. There are paint peeling, dents, rust, scratches, and feeling of usage. Fender Mexican Standard Jazz Bass In Brown Sunburst (2018). Condition is New (other). I purchased this new 2 months ago. It’s a great player. The neck is straight and the frets are level. The action is 8/64” from the factory. I will set it up to the winner’s specs (I prefer 6/64”). Very nice alder body with some cool flame in the grain. No gig bag but will be well-packed in original double boxes. Thanks for looking. Diamonds quality and color can only be estimated, each of gemologist/jewelers have their own opinions. 5 maquise diamond ring. total diamond weight is about 1.1cts. Diamonds are H-I/Si1-Si2. Ring weighs 2 grams. Model: 1982 Aria Pro II, SB-1000. This item is sold out everywhere in Japan and very hard to get it! This applies only to products that originally have hard case. With hard case. Scratches due to usage are seen on body. Serial Number: HPH163237. MPN: BB735A DCS. Alder/ Maple/ Alder Body. Knowledgeable and friendly Sales Advisors at the ready. Our service doesn't end with the sale either. Full Manufacturer Warranty Included. Beautiful Christian Louboutine shoes. These shoes were rarely used as you can see the bottom of the shoes are still in good condition. I also had a black pairs and sold them locally. I gave the person the box of these shoes so the box in this pictures is for the black shoes. Dont let this deal get away! Eminence 12" KAPPA PRO-12A Bass Speaker. RMS Power 500W. Top Mounting Depth 6.22in. Woofer Material Poly / Plastic. Bottom Mounting Depth 6.22in. Surround Material Cloth. Magnet Material Barium Ferrite. The cutting-edge Milestone 4-String Electric Bass Guitar is the result of Peavey's continual dedication to the working musician. The body design is both classic and elegant. The perfectly balanced body provides an intuitive feel, as if the bass is an extension of the player's body. Marcus Miller and SIRE wish to see everyone enjoying and playing music. To make this happen, Marcus Miller and SIRE have been on a mission for several years to build the best quality bass at an unbelievable price, making it available to everyone. Sadowsky MV5 24 fret bass . Condition is Used. From my personal collection and batch. Up for grabs is my personal and hard to find 1970's HOHNER jazz bass guitar. This is a very early model probably from the lawsuit era, serial dates 75's?. Bass has nicks and dings here and there typical of an used or old bass, but solid! This item is slightly used and has been thoroughly checked out by our experts to make sure it is in perfect working condition. This item is covered with a one year warranty from Sam Ash. The ESP LTD F-415 5-string bass provides all the thunder where and when you need it. Hard shell case. Nashville, TN. Used Traben Array 4 string. Works great and no playing issues. Will need fresh strings. Small marks in finish throughout, nothing major. No case, no gig bag. This bass was masterfully crafted in England from a maple solidbody with a gorgeous and smoothed out very soft V-profile maple neck with a zero fret and a rosewood fingerboard. This bass is in Good condition, with a bit of normal finish checking on the body as well as minor neckwear, a chipped nut and finish dings around the body. Most of our guitars are individually photographed, and are set-up with care by our in-house luthier. (Bridge Pickup), Master Tone. Black Finish. Includes: Original Hardshell Case, Candy, Straplocks. No RMA needed! HOFNER HI-BB-SB BEATLE BASS GUITAR. Reissue Genuine Hofner Tea Cup Knobs. Genuine Hofner Flatwound Short Scale Bass Strings. This violin-shaped model is commonly referred to as the "Beatle bass.". The hollow body and set neck will give you the warm, round tone you expect from the violin bass. 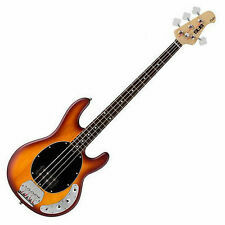 The bass guitar is an electric instrument that performs in both lead and backing roles. They are commonly used across a huge variety of musical genres and are attractive for their versatility, sound, and design. Manufacturers such as Fender and Ibanez offer a variety of both modern and vintage bass guitars, and each has multiple models with their own characteristics. 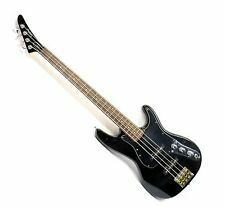 Regardless of the model or series, a bass typically has four strings. They are tuned the same way as the first four strings on a regular guitar: E, A, D, and G. Some musical genres have alternative tunings, though. For example, metal often uses "drop D" tuning, where the E on the lowest string is tuned down a step to D. Most alternative tunings involve tuning down. Some basses have a fifth string. Usually this is added to the low end, where it becomes a B in standard tuning. In rare cases. it will be added to the high end, where it is known as a tenor fifth string and becomes a C. In even rarer cases, a bass can have six strings, using both the low B and the high C. The neck of the bass can be comprised of woods that range from maple to rosewood. Do you need a special amp to play the bass? Bass guitars require a bass amp. It is possible to play a guitar through a bass amp, but you cannot play a bass through a guitar amp without damaging the amp. Amplifying low-frequency sounds is more challenging and requires both different equipment and more space compared to an ordinary guitar's amplification needs. Like guitar amps, bass amps can be combined or separated into the head and the speaker. Combo models are compact, but separate stacks are capable of higher volume, making them suitable for live play in large volumes. Generally, higher wattage translates to higher maximum volume. You can also add effects to the tone at the amp itself or you can add pedals and other sources to your signal chain. Do you play bass with a pick? While the electric guitar is mostly played with a pick, the bass or jazz bass can be played with either a pick or your fingers. Because of the sensitivity of the pickup on the bass, the two tend to produce somewhat different tones. For example, finger style play can create additional sound from the impact of the strings against the frets, while playing with a pick offers a sharper, more staccato sound. Neither style is better than the other, and there are many famous examples of players using each one. Sometimes, there are conventions of play for a particular genre, but more often it comes down to how a bassist originally learned to play.